This hearty, healthy tomato basil soup is easily made in under an hour. Both kids and adults will rave for this one! Top with crispy, gooey grilled cheese croutons and serve with a green salad for a delicious weeknight dinner. In my mind, tomato soup and grilled cheese will always be synonymous with classic American comfort food. I find it endlessly interesting what everyone else’s idea of a true comfort food is, whether it stems from a different culture or country, or even if it’s just spicing up a classic with a special twist. 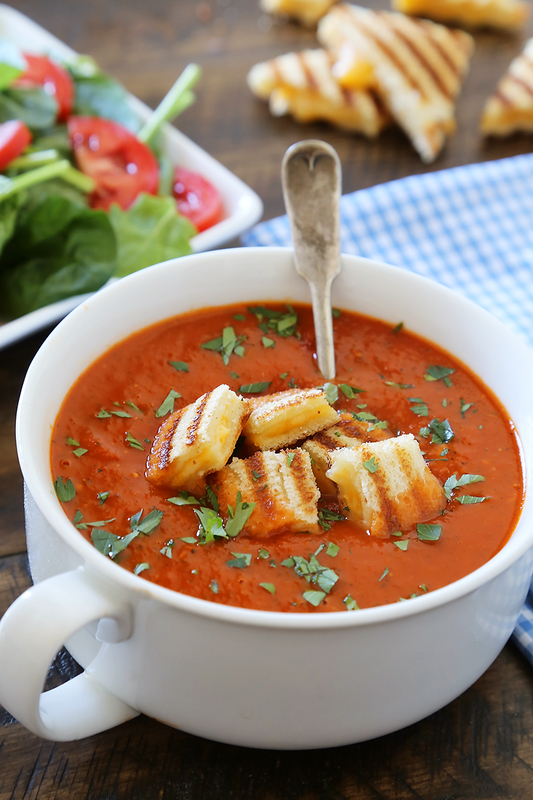 However, I think we can all agree, especially in the cooler months, that a warm, rich tomato soup with crispy, buttery grilled cheese is hard to resist. Just imagine wrapping your cold winter hands around a warm mug of this soup! Scoop up a soup-soaked, gooey grilled cheese bite with your spoon, and sail straight into heaven. Makes me want to wrap up in a warm blanket, sit by a fire, and pretend that it is not still 90 degrees in Texas right now. The great thing about this soup, though, is that you can find the ingredients year round! All you need for this recipe are simple pantry staples, including whole peeled canned tomatoes, chicken broth, brown sugar, garlic and spices. 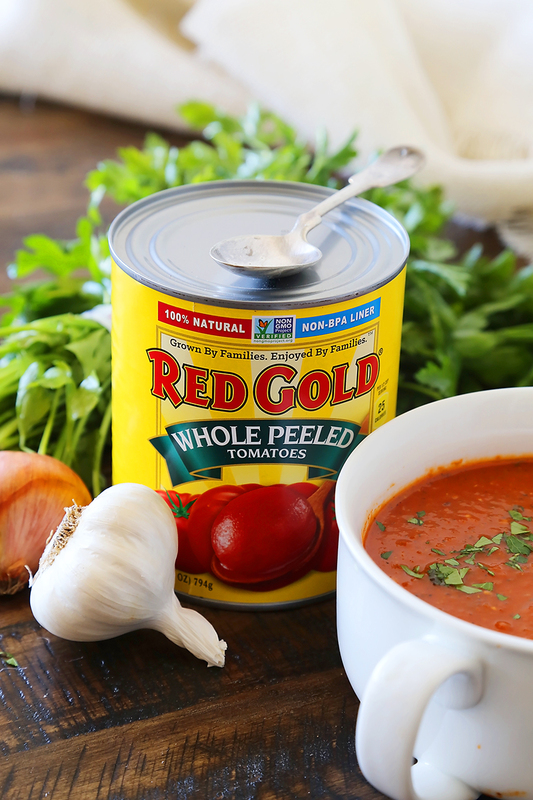 These Red Gold Whole Peeled Tomatoes always add the perfect balance of sweetness and acidity, and their hearty texture breaks down easily into a silky soup. They’re perfect for other soups, stews and hearty braised dinners that we love in the winter. As for the basil? Use fresh if you have access to it, but I always keep dried basil on hand, which livens up this thick, savory soup. Don’t you want to just reach out and grab one of those gooey, toasty grilled cheese bites? I heard the calories don’t count if they’re mini. No need for any special bread to make these mini grilled cheese “croutons” for your soup. A heartier white or wheat bread is best, though, so they avoid dissolving into your hot soup. I simply sizzled some white bread and shredded Colby jack cheese in my grill pan. A minute or two on each side, then onto a cutting board. Let them cool for a few minutes before cutting, if you can, but when they’re this tiny, cheesy and tempting? It is a lessen in patience, my friends. In collaboration with Red Gold Tomatoes, a longtime favorite brand of mine, I created this recipe to not only fill your bellies, but to raise awareness of how hunger impacts families across the nation. Did you know that 1 in 7 households do not know where their next meal is coming from? As a family owned company, Red Gold feels strongly about helping other families, which is why they have partnered with Feeding America, the nation’s leading domestic hunger-relief organization. This October, Red Gold has launched the Crush Hunger campaign, encouraging families to share a family meal to raise awareness of hunger. For every Red Gold product purchased throughout the month of October, Red Gold will donate a meal to someone in need. Their goal is 1.7 million meals, and if that could be reached, I mean, how incredible would that be? Buy a Red Gold product, or two or three, and help a family in need. How else can you help? Well, I’m glad you asked. Post your favorite family meal on social media (Facebook, Twitter or Instagram) with the hashtag #HelpCrushHunger, and you will be entered to win a Red Gold Family Meal Kit and $100 to donate to your local food bank. Visit www.HelpCrushHunger.com for more information. You can truly make a difference with a small purchase or a social media post, so please help spread the word on #HelpCrushHunger today! In a medium pot set to medium heat, add olive oil. Once hot, add shallot, garlic, red pepper flakes, basil, salt and pepper. Cook, stirring frequently until shallots are soft, about 3-5 minutes. Stir in broth, tomatoes and brown sugar. Cover pot and bring to a boil. Reduce heat and simmer until tomatoes are soft and able to be gently mashed with a fork, about 30 minutes. Puree with an immersion blender, or add mixture to a food processor or blender, and puree in batches if necessary. Return to pot, off heat, and cover until ready to serve. Set a grill pan to medium-high heat. Spread 1/2 tablespoon butter on 1 side of each bread slice. Turn the slices over. Top 2 slices with cheddar. Place remaining 2 slices of bread on top, buttered sides up. Add sandwich to pan and grill until the bread is golden and the cheese is melted, about 2-3 minutes per side. Let cool for 1 minute and cut into 1-inch cubes. 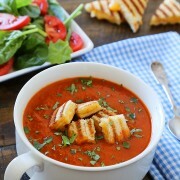 Ladle soup into serving bowls and top with grilled cheese croutons. Sprinkle with chopped parsley or basil, if desired. For a creamier soup, whisk in 1/4 cup of heavy cream off-heat, just before serving. Disclosure: This recipe was sponsored by and created for Red Gold Tomatoes. All opinions are my own. Love the idea of adding the grilled cheese croutons. 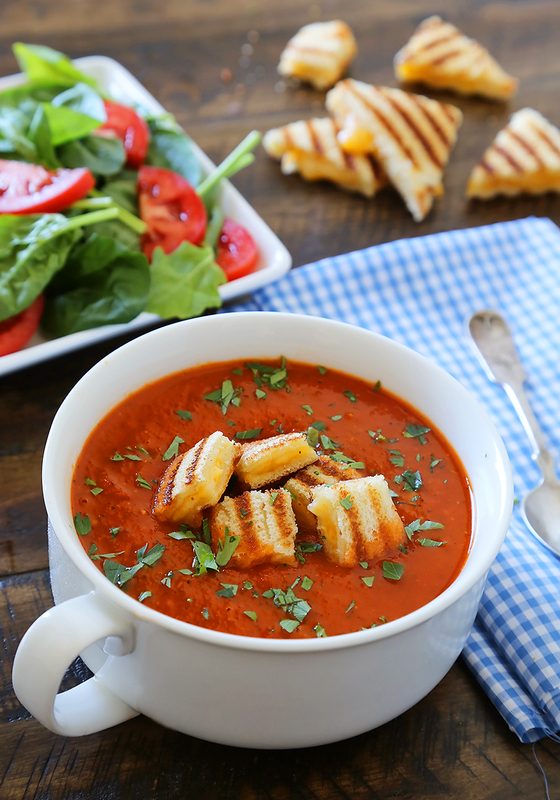 I agree….when ever I think of tomato soup, I think of grilled cheese. And you’ve definitely made me hungry for both! This sounds amazing!! Perfect for the season! What a great idea! 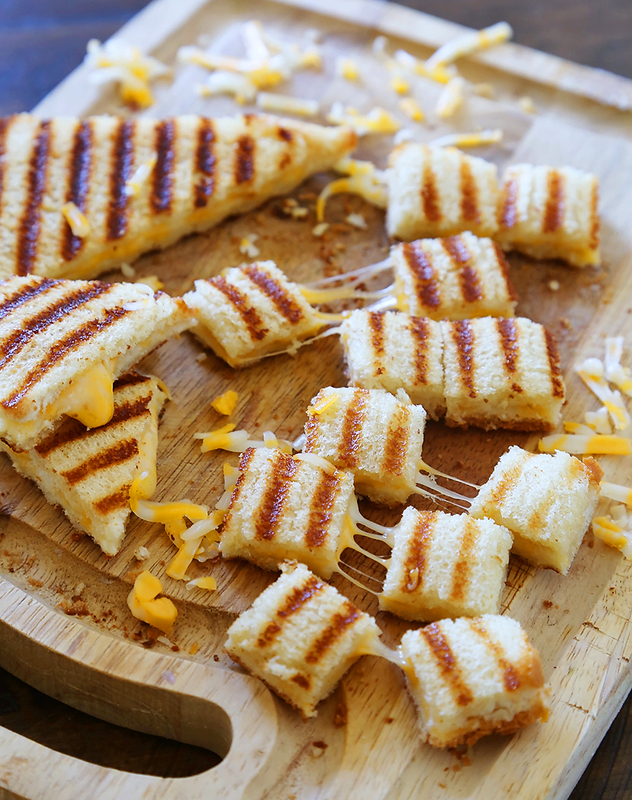 Grilled cheese croutons! I love it!